Let's face it...we always want to get the most for our money! 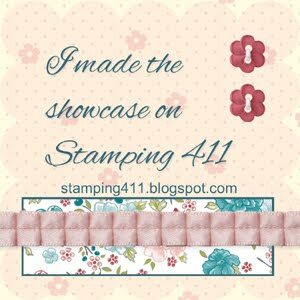 So, for my 3D how-to feature this week, I want to show you how to make two projects using the fun Scallop Envelope Die! 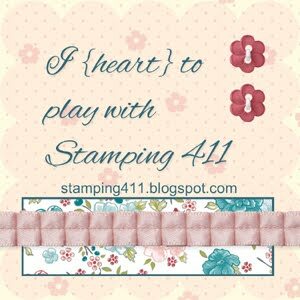 The Scallop Envelope die is fun all by itself with a little notecard tucked inside and hanging on the side of a gift bag or as a little love note tucked into a child's lunchbox. But, you can also use it on the front of a card! 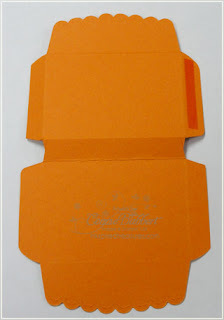 On this card, I made one of the Scallop Envelopes from Pumpkin Pie cardstock. 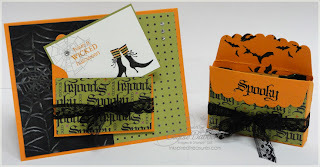 Inside, I stamped the images from Wicked Cool with Basic Black Ink and the words with Old Olive on Whisper White. I layered it on Old Olive cardstock. I added Rhinestone jewels in the center of the spider web and on the laces of the boots! I colored the socks with my Old Olive and Pumpkin Pie Stampin' Write Markers. I stamped the bats in Basic Black on the back flap of the envelope and added a piece of Wicked Fun Designer Paper on the front. I wrapped some of the Black Raven Lace Ribbon around and tied a bow on the front of the envelope. In the background I used the Spider Web Impressions Folder that I highlighted with the Platinum Shimmer Paint and more of the Wicked Fun DSP. The base card is Pumpkin Pie. 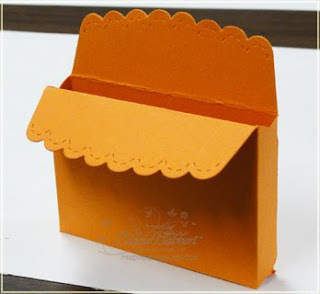 For the scallop envelope box, I used two of the dies cut from Pumpkin Pie cardstock. I cut the bottom flaps 1/2" from the bottom score line. Then I added Sticky Strip to the tabs on one side and one of the bottom flaps. Starting with the bottom flaps, remove the red liner and adhere them together. (Note: stamp on the envelopes before you put them together...trust me! lol!) Remove the side liners and adhere the tabs together on the sides. I folded the front scallop piece down and left the back one standing up. I again decorated the front with Wicked Fun Designer Paper, wrapped the Raven Lace Trim around and tied with a bow. 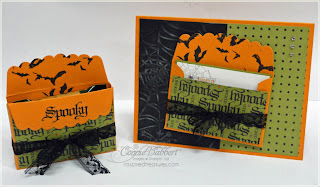 I stamped Spooky from Wicked Cool stamp set on the front, along with some more bats, in Basic Black. Inside, two Ghirardelli Chocolates fit perfectly...a nice little gift for a special co-worker or friend! 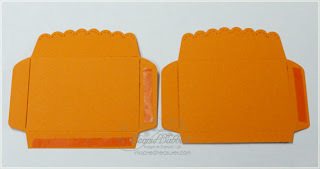 Hope you enjoyed a couple ideas on using the Scallop Envelope Die! Awesome Connie!!! Thanks for the reminder to use this die and I love finding out more uses for our stuff!! Very cute Connie, great job!